GB made these stems starting in the mid/late 1940s. This longer version only appears in the 1947 leaflet and the shorter 1¾" version survives only into the 1966 GB catalogue. They do not appear in any later extant catalogues and do not seem to have been made in any other lengths. A similar design was offered by GB much later in the 1970s - the 'Nova' stem, in metric lengths - with a different T-shaped rather than I-shaped girder profile. 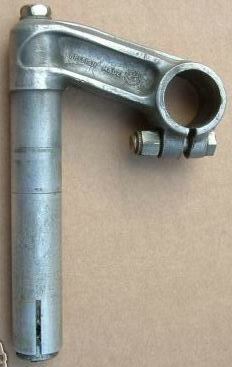 Sturmey Archer made (or labeled) a similar stem.